Harvest Collection on Compass Bay. New in 2009 this town home will cater for all parties be it couple, small families or larger families as well as golfing parties. Compass Bay is located on side of US Highway 192 which allows excellent access to all of the major attractions and golf courses that Orlando has to offer. Superbly furnished to maximise you holiday experience. Located on side of US192 between markers 10 & 11. Simon Collingwood. At home in England I work in the agriculture, I was looking to branch out and try my hand at something a bit different so i ended up with my second home in Kissimmee. I am really enjoying dealing with people from all over the world who have contacted me and made bookings. So far it has all been going well and I just love being able to help people find a great place to stay for there Florida holiday. En-suite bathroom, bath, shower, WC, vanity hand basin, hair dryer, mirror. Bathroom 2, bath/shower, WC, vanity hand basin, hair dryer, mirror. 1/2 bathroom, WC and vanity hand basin. Living area with queen sleeper sofa, 2 arm chairs, cocktail table, coffee table, 40" TV, DVD player and dvd collection PS2 plus games, dining area dining table and 6 chairs, telephone . Free Wi Fi. Side by side refrigerator, range oven and hood, microwave, multi cycle dishwasher, stainless steel 50/50 sink, waste disposal system, kettle, toaster, coffee maker, blender. More golf courses than you can imagine can be accessed within 5 miles of Compass bay, Falcon Fire, Champions Gate, Celebration, as well as the Disney courses to mention just a few. Notes on accommodation: Second home across the street for larger groups. Outside: A small patio area is accessed through the patio doors which looks over the lake. Compass Bay has a large heated swimming pool and Cabana for exclusive use by residents with plenty of sunbeds and parasols. There is a children's play area with play equipment. The grassed areas are maintained to a high standard as is the rest of the community. Utility Room: Whirlpool washer and dryer, iron and ironing board, plus many cleaning items (not intended for use!). Cleaning / Towels / Linen / Maid service: All towels and linen supplied but not beach or pool towels. Mid stay cleans can be arranged at extra cost. The home will be thoroughly cleaned before your stay and again after. Other: Pool table, air hockey and dart board installed in dedicated games room. Cot and high chair are free of charge. Wi Fi access. Great location. Convenient pool. Close to all the parks. No complaints! We had a perfect time there! We are very satisfied with our stay in this house. We appreciate your location and comfort. We loved it! We loved this place. We took a last minute trip and our usual place was booked. This condo is every bit as nice as it looks! Great location! We had yet another great stay at Simon's Harvest townhouse. Everything was fantastic, the location cant be beat. We particulary enjoyed the lake view at the rear and the brand new pool table! And the townhouse is completely equipped, right down to a corkscrew! We have already booked again for 2019. My family and I spent 4 nights in this unit. 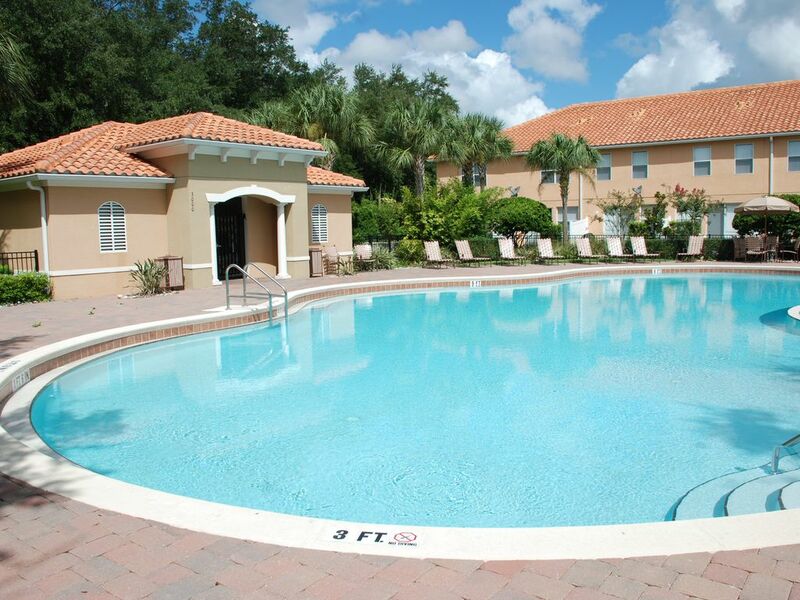 It is in excellent condition and a great location to visit Disney and legoland. Had everything we needed including pack n play. Kids enjoyed the heated pool. We had a wonderful holiday that was made even better staying at this lovely villa. It was a pleasure getting back from the parks & having such a great place to relax. The patio overlooking the lake was so nice. It was nice & clean & had a real home from home feel about it. It was really close to Walmart & the 192. There's a good range of restaurants to eat in locally, Perkins, Crackerbarrel & the Longorn Steakhouse being amongst our favourites. The parks are not too far away either. Having been coming to Florida on & off since 1993 this is one of the nicest places we've stayed in. Simon was absolutely great to deal with. So helpful. Thank you. We will recommend to family & friends & hopefully will be back in the near future. Thanks again Simon. Clearwater is one of the closest beaches approx 1.5 hrs away. Approximately: Orlando International Airport 25 mins, Sanford International Airport 50 mins. Dollar car hire recommended. Located on highway 192 between markers 10/11. Universal parks 12 miles away. Disney Parks from 4 miles away. Sea World and Discovery Cove 6 miles away. Premium Outlet shopping from 4 miles away. Colonial bank and 7 Eleven 3 mins walk away. Many restaurants located along US highway 192. Walmart 1/2 mile. Booking Notes: We can do a stay shorter than 5 nights but it would be the same rental rate as a 5 night stay Changeover Day: Any day.